CD10 antibody LS-C12760 is an unconjugated mouse monoclonal antibody to human CD10 (MME). Validated for Flow, IHC, IP and WB. Recognizes the human CD10 cell surface antigen, a 100kD glycoprotein expressed by acute lymphoblastic leukaemia cells and by peripheral blood granulocytes. CD10 is also known as the Common Acute Lymphoblastic Leukaemia Antigen (CALLA). 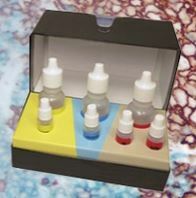 Suitable for use in Flow Cytometry, Immunohistochemistry, Immunoprecipitation and Western Blot. Flow Cytometry: 10 ul of the suggested working dilution to label 1E6 cells in 100ul. Immunohistochemistry: Frozen. The applications listed have been tested for the unmodified form of this product. Other forms have not been tested.